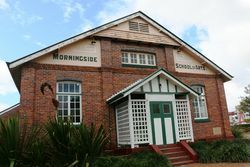 The Morningside School of Arts was erected to commemorate those who died in service or killed in action during World War One. "This hall stands as a fine example of the co-operation of the people of Morningside in honouring their obligation to those who had given their lives in the defence of their country," said his Excellency the Deputy Governor (Sir William Lennon) at the official opening of the Morningside Memorial School of Arts last night. The building he said was a beautiful one and it stood on a beautiful site. As a memorial it had much to commend it. Most memorials took the form of monuments and could serve no useful purpose. 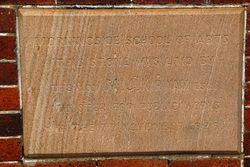 This building would remain as a constant reminder to those who in future would use it for dancing and other amusements of the sacrifice made by those who had left their homes and families to fight in the cause of the just. The Brisbane Courier (Qld), 20 February 1926. The Hon. M.J. Kirwan Esq.